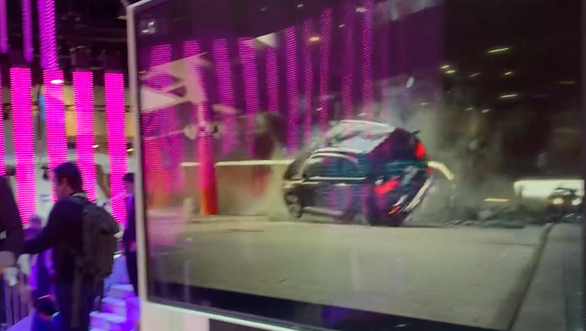 Audi is aiming at upping the game for in-car entertainment with its new immersive entertainment concept which might soon be a reality. The concept brings 4D entertainment to the car cabins, adding physical feedback to what you are watching on the screen. Audi used an A8 to demonstrate this technology to us. We watched a mass-demolition sequence from Avengers on the infotainment screen, while the car's cabin rolled and pitched as an Audi Q7 barrel-rolled, the seats vibrated as the debris flew around and the air-conditioning was in charge of replicating the direction and force of the wind. The A8 features a 48V electrical subsystem which allows fast suspension movement to negate any roll and pitch while you are on the road. For the immersive entertainment, however, it does the exact opposite and literally shakes up the cabin to give the occupants force-feedback. The vibrations in the seat are created using the massaging system and the air-con with its fragrancing function and multi-zone control adds a bit of the environmental edge to the experience. The immersive experience can only be had when the car is stationary, of course. While the technology or underpinnings needed for it are already available in most upcoming cars from Audi, thanks to the 48V system, we believe that the only limiting factor for this immersive experience could be lack of compatible content. But it is a nice concept and one that adds a new dimension to in-car entertainment and mobile theatres.